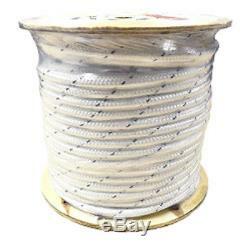 CWC Double Braid Polyester Rope - 5/8 x 600 ft. Holds up better than nylon when exposed to sunlight. Less than 1 percent stretch. Easy to splice for optimum efficiency. Suited for towing and anchor lines. PRODUCT SPECS: LENGTH: 600 ft. TENSILE: 12274 lbs, WEIGHT: 75 lbs, PART #: 347100. Super-low stretch double braid polyester rope. Radial construction provides maximum abrasion resistance for long wear life reducing any chance of snag and virtually eliminates the possibility of core herniation. Tops among all popular fibers for weathering characteristics. Excellent abrasion resistance and strength wet or dry. Designed to withstand UV rays and many common chemicals. High strength low stretch and torque-free. The item "CWC Double Braid Polyester Rope 5/8 x 600 ft, White" is in sale since Monday, October 2, 2017. This item is in the category "Sporting Goods\Outdoor Sports\Climbing & Caving\Ropes, Cords & Slings". The seller is "continentalwesterncorporation" and is located in California, US. This item can be shipped to United States.